Dave Horsley, pours a celebratory drop of ‘Old Rosie Scrumpy’ to christen the new Tarves Community Orchard, watched by local volunteers yound and very young! The sun shone Sunday (15th March) and it was quick work in the planting of an avenue of trees at Bede Way Tarves – to start a community Orchard Project. Paul Johnston for PUT (Pitmedden, Udny Tarves Community Co-operative) has organised the PUT team to plant the avenue of Apple trees on the ground at the back of Bede way house, at the bottom of Manse Walk. “It was a happy band that turned up” Said Paul. “The group planted 14 Apple tree and 4 pear trees that cross with a mix of dessert eating, juice and cooking. 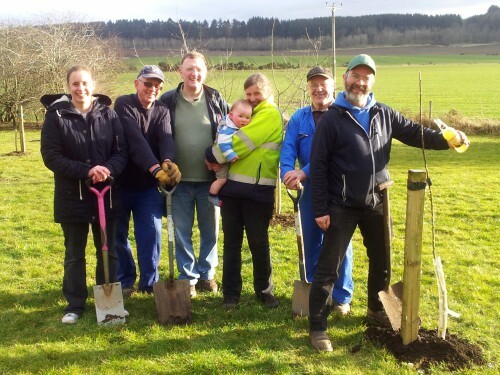 The planting was done by of Gordon Brown of Tarves Amenities and Bob Bamlett, Dave Horsley, Bob and Catriona McIntyre and daughter, Anna with her baby son Alex along with Paul Johnston. The fruit from mature trees will be the subject of a community consultation on what they think the fruit could be used for. “We know there are people who want to do even use the apples for cider” said Paul. Local people will be asked to get involved and are encouraged also to support the apple orchard project at Pitmedden Gardens where there is a potential for the Tarves and Udny community orchards to support the Annual Harvest Apple Sunday.